In case you are wondering, I don't receive enough jewelry in my life and I love jewelry. Hint, hint... I especially like jewelry in which the charms can be easily removed and replaced with others. I took one look at Chamilia Spoken Petites Collection and I immediately fell in love with it. The main pendant, petite millegram droplet, is shaped like a tear dropped horse shoe where I use to hang the pretty little charms. They will be releasing a new collection of charms just in time for start. This collection has one of favourite emoticons of the smiley face with hearts for the eyes. It is so cute that even my daughter wants one. She was "ooo"ing and "aww"ing and letting me know how pretty it looks on me. The charms are really small, smaller than a dime. I would say wearing 1-3 charms at a time is ideal. You can fit more but it will be too crowded and you won't be able to tell what you are wearing. You might be here shopping for your mom but I won't be surprise you might want to get something for yourself too. Happy Shopping! This Mother's Day, Chamilia (https://ca.chamilia.com), a Swarovski Company, will be offering more than 50 charms (including alphabet charms) for C$35 or less in its Petites Collection. When paired on a neck chain, the pieces offer customized sentiment messaging signature to the brand. And together they form a tiny treasure for Mom's jewel box. The entire Chamilia line is made from sterling silver or 14 karat gold and features genuine Swarovski Crystals and Swarovski Zirconia. The brand follows strict Swarovski Group guidelines for quality and aesthetic standards. 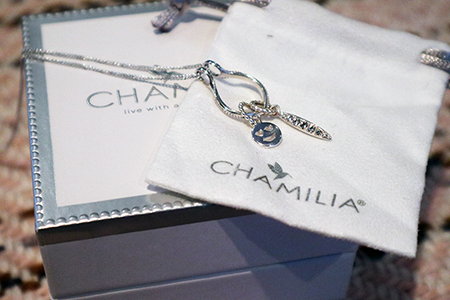 Based in Cranston, RI, Chamilia is an American company that was established in 2002. Since its purchase in 2013, it has been a member of the Swarovski Group, a world leader in quality and innovation. Each of the more than 400 exclusive charms available from the brand are made from .925 sterling silver or 14 karat gold and feature genuine Swarovski Crystals or Zirconia, or are handmade with Italian Murano Glass. The brand follows strict Swarovski Group guidelines for quality and aesthetic excellence. For more information, please go to www.chamilia.com. I love the Swarovski crystals and have a few pieces myself. I didn't know that Chamilia is now part of Swarovski. Ooooo these sound very nice, I am going to check them out, I love that you can change the charms! Nice gift for Mother's Day! The petite millegram droplet is a pretty place to hang a selection of charms - wonderful idea. Very lovely and elegant I Hope Your Having A Great Mother's Day ! the charms can be easily removed and replaced with others and I love this about this piece.